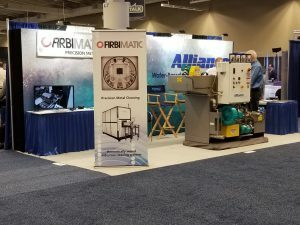 Alliance Manufacturing Parts Washers at PMTS 2019 | Dempsco, Inc.
Alliance Manufacturing and Dempsco, Inc. had another successful year at the PMTS Show in Cleveland. Alliance Manufacturing offers batch, cabinet, conveyorized, dunnage, monorail, rotary drum, and custom/special parts washers. Contact Dempsco at 937-436-1000 / info@dempsco.com for all your parts washing requirements – we would be happy to assist you in choosing the right washer for your application. Alliance’s booth at PMTS 2019 is shown below.